You’re on high school graduation quotes, page 7 of 8 Graduation wishes, messages and quotes. See related page menu at bottom of page. What to write on a high school graduation card? 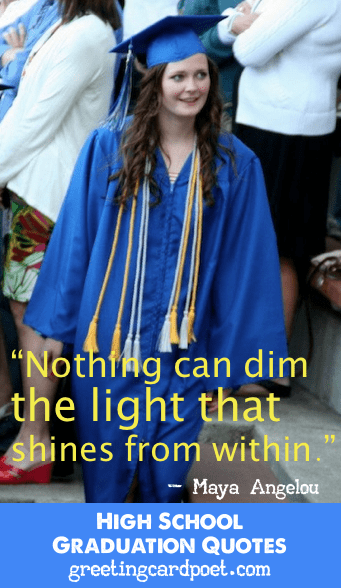 Our high school graduation quotes may both inspire and amuse you. Choose from this collection for yearbook write-ups, card messages and graduation party invites. High school graduation comes at a very important time in a person’s life. The options seem limitless, and yet there may be a certain amount of fear of the unknown. Some of these insights might help ease that uncertainty. Enjoy these high school graduation quotes. Life is not about how you survive the storm, it’s about how you dance in the rain. It is impossible to live without failing at something, unless you live so cautiously that you might as well not have lived at all—in which case, you fail by default. There are two great days in a person’s life – the day we are born and the day we discover why. A table, a chair, a bowl of fruit and a violin; what else does a man need to be happy? You are educated. Your certification is in your degree. You may think of it as the ticket to the good life. Let me ask you to think of an alternative. Think of it as your ticket to change the world. You will find the key to success under the alarm clock. Just remember, you can’t climb the ladder of success with your hands in your pockets. Life is an improvisation. You have no idea what’s going to happen next and you are mostly just making things up as you go along. The grass is always greener where you water it. A man who has never gone to school may steal from a freight car, but if he has a university education, he may steal the whole railroad. 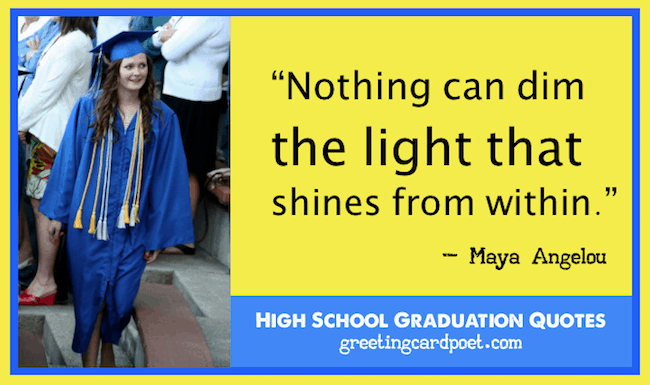 Tip: Consider using these high school graduation quotes for Facebook posts, Instagram captions, card messages, texts and more. People who give the best are those who give of themselves – your time, talents, words, knowledge. To succeed in life, you need three things: a wishbone, a backbone and a funnybone. Are you in the a picture paints a thousand words camp? Check out Graduation Images and Memes. Here is little habit that can make a big difference. Send sunbeams. Intentionally send a word of encouragement or appreciation every day to one person. Dance. Smile. Giggle. Marvel. TRUST. HOPE. LOVE. WISH. BELIEVE. Most of all, enjoy every moment of the journey, and appreciate where you are at this moment instead of always focusing on how far you have to go. Life is either a great adventure or nothing. Don’t ever confuse the two, your life and your work. The second is only part of the first. And the corollary to carpe diem is gratitude, gratitude for simply being alive, for having a day to seize. The taking of breath, the beating of the heart. Gratitude for the natural world around us — the massing clouds, the white ibis by the shore. In Barcelona a poetry competition is held every year. There are three prizes: The third prize is a rose made of silver, the second prize is a golden rose, and the first prize: a rose. A real rose. The flower itself. Think of that the next time the term “priorities” comes up. Ralph Waldo Emerson once asked what we would do if the stars only came out once every thousand years. No one would sleep that night, of course… We would be ecstatic, delirious, made rapturous by the glory of God. Instead the stars come out every night, and we watch television. It’s harder to build than destroy. To build is to engage and change. In jazz, we call progressing harmonies changes. Changes are like obstacles on a speed course. They demand your attention and require you to be present. They are coming…they are here — and then they are gone. It’s how life comes. Each moment is a procession from the future into the past and the sweet spot is always the present. Live in that sweet spot. Be present. My favorite animal is the turtle. The reason is that in order for the turtle to move, it has to stick its neck out. There are going to be times in your life when you’re going to have to stick your neck out. There will be challenges and instead of hiding in a shell, you have to go out and meet them. You’re going to be doing things and you are going to be scared. It’s natural. Everybody is. And when that happens, and it’s going to happen more than once, do me a favor: go back to the days of your childhood, go in the 100 Acre Wood, take a deep breath and just say, “I’m stronger than I seem, I’m braver than I believe, and I’m smarter than I think.” And then go do it, that’s what it is. And now go, and make interesting mistakes, make amazing mistakes, make glorious and fantastic mistakes. Break rules. Leave the world more interesting for your being here. If you have any suggestions for high school graduation quotes, please let us know via the contact page. Thank you.